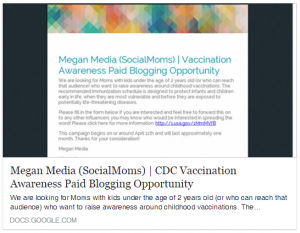 Who is behind Megan Media (SocialMoms)? Where is that money coming from? Is this San Francisco based public relations agency acting as a fence, remitting money (presumably from vaccine manufacturers) to moms in exchange for generating astroturf perception of support for the CDC’s untested vaccine schedule on social media?